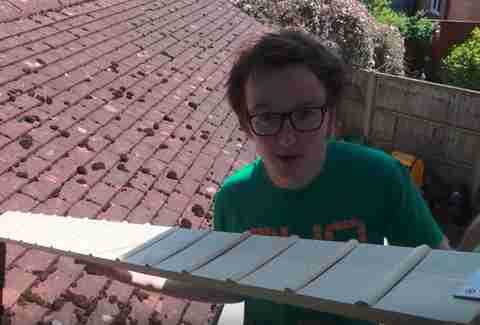 Chris Burton was fast asleep when a strange noise made him jump out of bed. 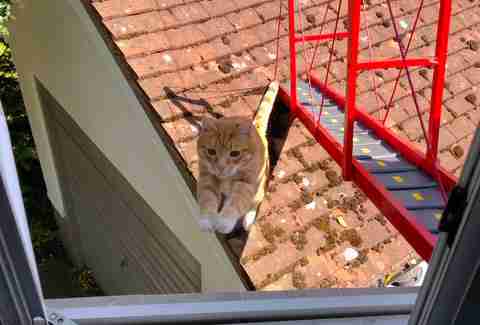 Burton’s cat, Reggie, has a habit of jumping from the second story bedroom window to a detached garage 3 feet away from their house in Surrey, England. 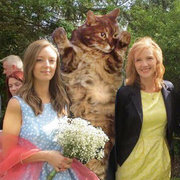 The daring cat usually makes the leap effortlessly, but that night, the sound of scrabbling claws suggested otherwise. “It was about 6 a.m. and I was in bed with my window open when I hear him slipping on the windowsill, followed by a very cartoon Road Runner-esque fading meow,” Burton told The Dodo. Burton and his girlfriend, Danielle, rushed Reggie to the vet, where an examination revealed that Reggie was unharmed by the fall. Though the cat was lucky to walk away without a scratch, after years of taking the shortcut from garage to bedroom, Reggie was not going to stop making that leap. At 9 years old, Reggie might not be as spry as he once was, so Burton decided to act fast before his cat got the taste for adventure again. 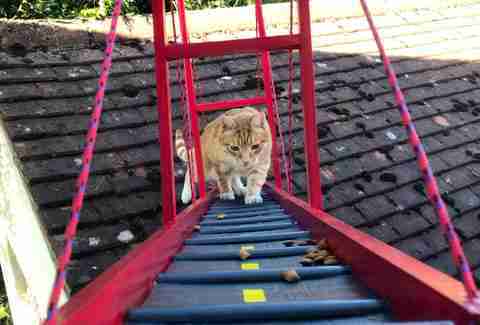 Burton set about designing a comfortably cat-sized bridge that could span from the windowsill to the garage roof. 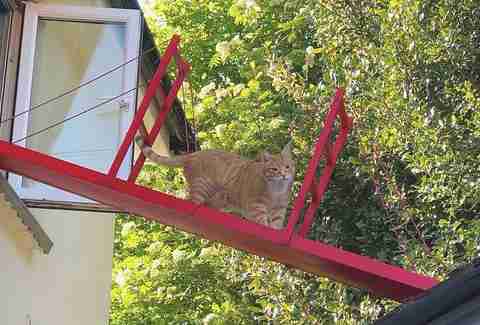 But he didn’t want to create just any bridge — he wanted to give his feline friend a more stylish and iconic way of crossing. At the time of its opening, the real Golden Gate Bridge was both the longest and tallest suspension bridge in the world. 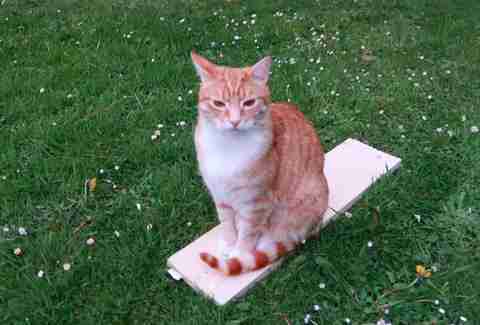 Making a cat version of this marvel of engineering would be no easy feat, but Burton was undaunted by the task. To construct the platform, Burton started with a few raw planks of wood, which he sanded down and cut to size. Footholds were glued in place, and a drawbridge attachment mechanism was tested. Once the bridge was stable, the beams were screwed onto either side of the plank, and string was laced through to mimic cables. Danielle filmed the entire process, which took just under a week, and they cut the footage into a video, which they posted to YouTube. After many generous coats of paint, the bridge was fastened in place and it was finally time for the big reveal. 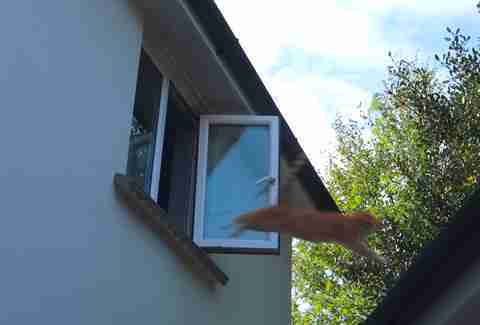 Only — Reggie continued to hop from roof to window. 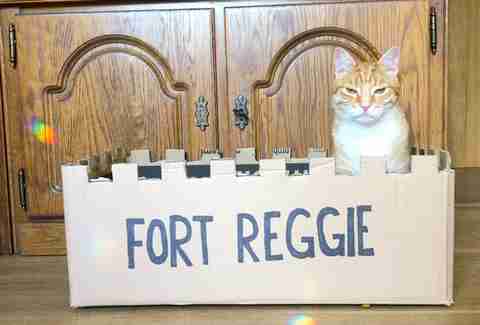 After days of frustration, Burton got a brilliant idea for how to change Reggie’s attitude: a tasty incentive. Now, when Reggie isn’t sleeping, sitting in a box or following Burton and Danielle around the house, he can safely access his favorite place via a sturdy little bridge all his own. And it’s not bad to look at, either. Though Burton is taking a break from cat projects for the time being, he still has a few crafts on the horizon that may improve his pets’ lives. You can learn more about Burton's crafts and travels on his YouTube channel.